Les tombes de la Basse Selca is part of the Tentative list of Albania in order to qualify for inclusion in the World Heritage List. We visited “Les Tombes de la Basse Selca” in April 2018 following our decision to try to “fill in” all of Albania’s current T List, as well as its inscribed, sites. You will find it more normally titled “Royal Tombs of Selca e Poshtme”. It consists of a series of rock-cut tombs situated on a rocky “acropolis” in empty country behind Pogradec which date to c4th -3rd Century BC and belonged to the Illyrian royalty. No, we didn’t know much about the Illyrians either and our “knowledge” of “Illyria” was limited to its occasional use as regional name across many historical periods in various areas of the Western Balkans! Wiki gives a quick overview. It is worth noting that the period of the tombs is contemporaneous with that of Philip II and Alexander the Great of Macedonia - Indeed in 358BC Philip II defeated the king of Illyria. A few searches will also identify that the ability to claim ancestry from the “Illyrians” is important to many “Albanians” and, to this day, plays a part in the relationships between Albania, Macedonia/FYROM, Serbia, Kosovo and Greece. The history and territory of these early Balkan tribes is not a “dead” issue! Have a read of “Who are the Illyrians? The Use and Abuse of Archaeology in the Construction of National and Trans-National Identities in the Southwestern Balkans” by Maja Gori if you want to know more! Our trip there in our little rentacar was “problematic” mainly because the road from Karkavec was undergoing a major reconstruction and we often found ourselves travelling along deep muddy ruts left by enormous bulldozers (and indeed following close behind them!). The road is likely to be finished soon but you will need to leave it at 41.010073, 20.514968 and follow a very minor road through tiny villages. The only people we saw were the old and infirm - 1 lady driving her (single) cow whilst her even older husband followed behind sitting on a donkey! This is remote and underdeveloped “Europe”. Stop at 40.989797, 20.522028 and you will see a rusting yellow sign with an arrow and the words “Varret Monumentale - Selcë Posht”. A footpath leads to a rocky summit around 300m away. There were some indications that, many years ago, this might have been a site with regular visitors - but the stone and concrete steps were now partly covered or collapsing. 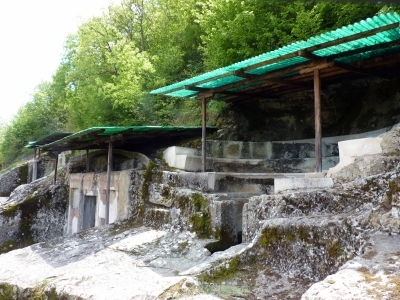 Apparently it was excavated from 1969-72 by an archaeologist (Neritan Seka) who, in 1990, was a founding member of the “Democratic Party of Albania” - the first opposition party after their legalisation towards the end of the Communist era. In 1997 he even served for 1 year as Minister of Internal Affairs (albeit for a different party!). The year in which excavations started may be significant - An 18 page monograph available on the Web titled “Archaeology in Albania 1973-83” contains this - “The First Conference concerned with the Illyrians and the origin of the Albanians took place in Tirana in 1969”. And this - “from the outset (archaeology) has received strong support from the Party of Labour (Communist party) under the leadership of Enver Hoxha”!! And this book - “The Practice of Archaeology under Dictatorship” also provides an insight into the way in which archaeology and “Illyria” were viewed in Albania at that time. Along the rock face there are (“officially” - but there seemed more) 5 tombs in the form of man-made caves. Some were partly decorated with external ionic pillars and carved porticos of “Hellenistic style” - but it seemed likely from the disintegration of some of the material (which looked suspiciously like concrete!) that this may have been “added” by archaeologists as a reconstruction. 2 of the tombs were on 2 levels with stairs up and seating around - quite “monumental” indeed (photo) but not, I would have thought, possessing “OUV”. They were all protected by somewhat ugly and flimsy roofs extending from the cliff face, presumably erected long ago by archaeologists. All were open for access. Inside, some had empty sarcophagi and others had carved wall niches. Some of the internal carving was very precise with stones having been cut to exactly to fill cracks in the rock. And that is about it! The “on view” remains are, in all honesty, rather limited. Apparently some jewellery and mosaics are on show in the Archaeological Museum in Tirana – but we didn’t see them. So - what did we gain from the visit? First - A certain satisfaction in getting there. Second - the chance to see some remote Albanian villages and countryside in the full flower of spring time. Third - an entrée to some aspects of the ancient and modern history of Albania which were previously unknown to us. If these are of interest to you then by all means go - but if you want fine archaeological remains then I wouldn’t bother! I certainly wouldn't go in the hope that the site may, one day, be inscribed! Unless ...... I note that it is just possible that Albania could squeeze it in as part of the Lake Ohrid extension. Its UNECO description makes no mention but Criterion iii is claimed on the basis that "The archaeological findings in the castle area of the city of Pogradec as well as the presence of the monumental tombs of Lower Selca in the region are evidence of the ancient Illyrian civilization". I would be very surprised however if ICOMOS were to accept that. It sits 24kms west of the Lake and, as far as I can see, isn't part of the lake's ecosystem. The map of the Albanian extension included in this report (page 4) by the "Ohrid Lake Transboundary Project" doesn't include it even though the text does mention it as "potential". We will see! As an aside, it is interesting to note that the 2 Albanian T List sites from 1998, this one and Durres, are the only ones whose UNESCO description is in French - all the later ones adopt English. In 1999 Albania joined “l'Organisation internationale de la Francophonie”. Might that have had something to do with it (indeed, it remains a member)? Durres could possibly be explained since French archaeologists have been (and still are) active there. But, as far as I can tell, Selce has never involved French archaeologists. Perhaps the same source prepared both descriptions? Also Apollonia’s description in English from 2014 might have been expected to be in French since its main archaeologist from the 1920s and 30s, Leon Rey, was French, and French archaeologists still maintain some involvement at the site. However, more recent work there seems to have involved other countries too as well as the EU. Or perhaps it is simply that the inexorable spread of English has been accepted. We certainly gained no sense of any “Francophonie” during our travels in Albania.